* Ask the butcher to trim the thick fat layer from the top of the lamb. Pick the parsley leaves and chop finely with a sharp knife. Place onto a large dinner plate. Combine the softened butter with the mango pulp, garlic, salt and pepper until smooth. Spread this thickly onto the lamb with a knife until its evenly covered, then press the lamb onto the parsley to make a green crust. Place the lamb into the hot oven and bake for 20 minutes, then remove and allow to rest for a further 10 minutes. While the meat is resting prepare the salad. Slice the onion as finely as possible then rinse under hot water from the tap to remove some of the strong onion flavour. Remove the seeds from the chilli with a teaspoon and slice as finely as you can. Place all salad ingredients into a bowl with the mint leaves and lightly dress with 2 tablespoons of good quality extra virgin olive oil, and season with salt and pepper. 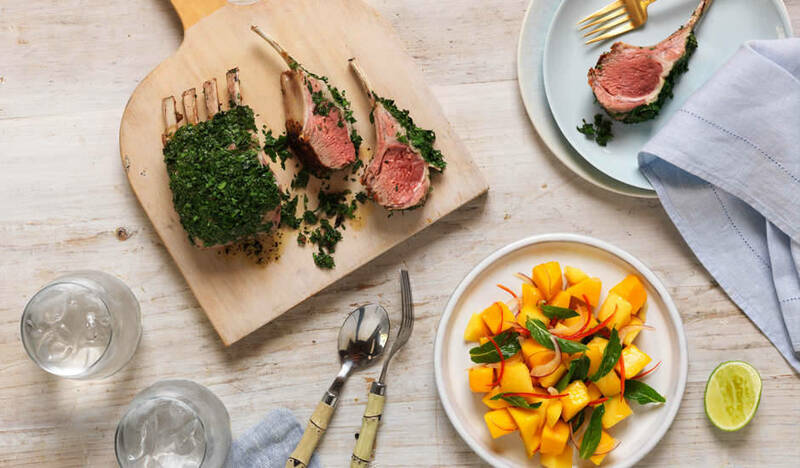 Slice the lamb into cutlets and divide onto 4 plates. Serve with the mango salad on the side.